PVI was created based on the vision to provide a learning and gathering space to immigrants as they strive to achieve citizenship through the civic, economic and political life of the Valley, as well as to stand with immigrants as they overcome economic, social and political oppression. 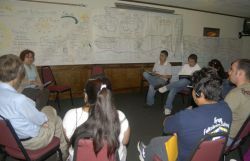 Based on this vision, PVI opted to focus its work on the principles of popular education with the belief that, by providing spaces where immigrants could share experiences and concerns and learn from each other together, they could reach an understanding of the social contexts and causes that exclude them from society. In turn, attaining this knowledge would lead to the empowerment of these communities as they solve their problems and positively change their realities. There is no single definition of popular education. 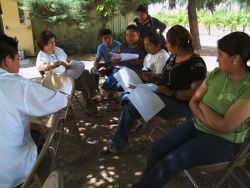 Popular education is a community education effort aimed at empowering adults through cooperative study and action. It is directed toward achieving a more just and equitable society. As its priority, popular education principles are aimed toward the poor, oppressed, and marginalized people of the world. Popular education is based on the assumption that the world can be changed, and that normal people can make that change. It is essentially inviting people to learn about the world in order to make it a better place for them and their children. One key principle of popular education is that participants are active subjects, not objects, in their experience of learning and action. Knowledge is not simply information handed down by experts, but rather it builds on the experiences and insights of the people participating.